Are you a big devotional reader? Most people have a genre they love, and others will read anything. Devotionals are one of those books that you love to read, or you stay away from all together. 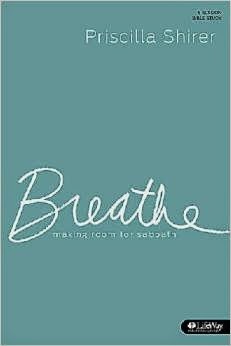 I'm not a huge devotional fan, but I enjoyed Breathe by Priscilla Shirer. It's only a five week devotional, and it contains a video devotion that coincides with the book. It's great for book club or home groups. Breathe is about taking time for rest, and how to apply it to your life specifically. Giving yourself a Sabbath and using it for resting your body, spirit, and mind is a key principal in the book. Priscilla points out that you need to separate yourself from work, from things that hold you down, and from activities that keep you constantly on the move. No one can keep moving all the time. You will eventually give out, and that's when you are the most vulnerable. Priscilla also points out that things will keep us from having margin in our lives. God has richly blessed us, but when we allow those things to take over our lives then we are living as slaves to those things that were meant to be blessings. If you are finding yourself running ragged all the time, can't find room in your closet for one more thing, or you are constantly saying yes to everything, then you need to read this book. God gave us boundaries so that we can be free; not so He could enslave us. Let me know what you think of Breathe. I would love to hear your thoughts.